Claim based on Autoplanner specification comparison as of September 10, 2015. ^2017 Accent 4-door/5-door manual transmission: 8.7L/100km City, 6.3L/100km Highway, 7.6L/100km Combined. Fuel economy figures are based on manufacturer testing and are used for comparison purposes only. Actual fuel efficiency may vary based on driving conditions and the addition of certain vehicle accessories. 2015 Honda Fit manual transmission highway fuel economy (6.4L/100km Highway) based on EnerGuide 2015 fuel consumption guide (Natural Resources Canada). ΩPrice of $15,627 available on all new 2017 Accent 5-Door L Manual models. Price includes Delivery and Destination charge of $1,595, fees, levies and all applicable charges (excluding HST, GST/PST). Price excludes registration, insurance, PPSA, license fees and dealer admin. fees of up to $499. Delivery and Destination charge includes freight, P.D.E. and a full tank of gas. Fees may vary by dealer. 2017 Accent 5-door GLS model shown. Price of model shown: $21,494. Price includes Delivery and Destination charge of $1,595, fees, levies and all applicable charges (excluding HST, GST/PST). Price excludes registration, insurance, PPSA, license fees and dealer admin. fees of up to $499. Fees may vary by dealer. Dealer may sell for less. Inventory is limited. Dealer order may be required. Even with the Accent 5-Door’s second-row seats up, you will have the flexibility and space for both friends and gear. Just think of the convenience and the possibilities-room for snowboarding gear, shopping bags and everything in between. Get the best of both worlds and travel with power and fuel efficiency in balance. 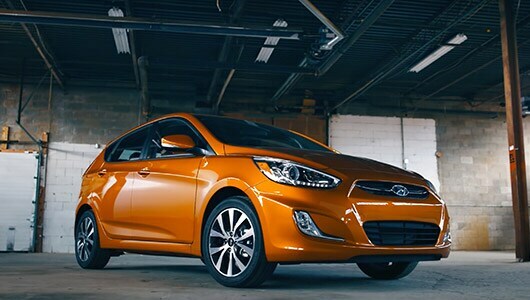 The Accent delivers power when you need it, plus fuel efficiency for the long haul. Available projection headlights with LED daytime running lights provide added style to the 2017 Accent. †Hyundai's Comprehensive Limited Warranty coverage covers most vehicle components against defects in workmanship under normal use and maintenance conditions. ††Hyundai's 24-Hour Roadside Assistance Program is a limited service and does not cover certain costs or expenses. Roadside Assistance is not a warranty. ^Fuel economy figures are based on manufacturer testing and are used for comparison purposes only. Actual fuel efficiency may vary based on driving conditions and the addition of certain vehicle accessories. The Bluetooth® word mark and logos are registered trademarks owned by Bluetooth SIG, Inc., and any use of such marks is under license. The SiriusXMTM name is a trademark of SiriusXM Satellite Radio Inc. All other trademarks and tradenames are those of their respective owners.